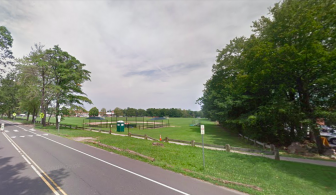 Though fellow members of the Board of Selectmen are voicing strong opposition, New Canaan’s highest elected official this week has pushed the idea of building a new police station on a Saxe Middle School field where a baseball diamond now stands. First Selectman Kevin Moynihan during budget discussions on Thursday questioned the superintendent of schools about the demand for athletic fields at Saxe and later pressed the recreation director about the prospect of building a replacement baseball diamond at Kiwanis Park. Benko responded that the area “is not big enough” because it lacks the 205 feet down a right-field line and 225 feet to center field that the current diamond at Saxe has. Moynihan responded that former Police Commissioner Stuart Sawabini—who brought forward the idea of building a new police headquarters on the Saxe field–also had measured it, as had the parks superintendent. The first selectman mentioned Sawabini’s proposal during a press briefing last week, generating wide discussion in town. Opened in 1927 as the town’s first high school, the Police Department building on South Avenue is in need of a renovation that’s estimated to cost about $10 million. Moynihan has eyed a commercial building downtown that could serve as a future police station (as well as a headquarters for district administrators) and has also said the major hurdle in building a new police station is finding town land to build on. Sawabini’s proposal, to build a new station along South Avenue, just north of the YMCA, is the only option that’s emerged, Moynihan said. Selectman Kit Devereaux on Tuesday suggested that New Canaan may be best served if the current building is renovated in place, instead of building anew or moving NCPD. Asked during Tuesday’s Board meeting while he presented NCPD’s budget whether the department’s current location is better than a proposed downtown site, Police Chief Leon Krolikowski said each location has advantages. When Williams noted that the current location is closer to schools than a building at the corner of Grove and Elm Streets, Krolikowski said that’s true and that’s why the Saxe fields location was suggested. What is wrong with our First Selectman? Why is he so determined to have a developer build senior housing at the current police station? Thank goodness for Nick and Kit’s common sense on this topic. At a time when the town faces significant budget issues, home value losses, slower trains and one of the highest debt per capita in Connecticut, spending millions of dollars that are not necessary is not a smart idea. Instead of just renovating the police station for less than $1 million dollars our first selectman would rather spend upwards of $10 million on new buildings, relocated fields in the “hope” of saving more than the police station renovation costs with another building the town doesn’t need. Mr. First Selectman, listen to the people pf the town, listen to your fellow Selectman and Town Council Members. Stop spending money like its printed in your basement, money each and every one of us will be paying long after you are gone. I have spent the past three decades studying how government works, how to make it work better, and then passing this knowledge along to new generations of mayors, city and county managers as well as elected officials. As Vice-President of Policy and Research for a non-partisan think tank, I studied alternatives state and local governments were facing and the best ways to choose amongst the alternatives. Whether it is a question of keeping or tearing down a historic building, building a new or renovating an existing building for a police station…these are just symptoms of the real issue here in New Canaan…we need an open and effective process to identify the issues we care about, to look at the alternatives before us, then to choose and implement the choice once made. I have lived in New Canaan long enough to love it, but unlike many who have decades and decades of time here, I grew up in an entirely different environment and have studied best practices in government all across the country. I don’t believe that the best present or future is in just copying old practices or in implementing any one person’s vision for New Canaan. Our leaders are working hard and doing a good job, but I believe we need to learn how to stop assuming any of us ‘knows’ what people want. We need to learn how to ask and how to listen to what all of here want, and while we will never have all of the people agreeing all of the time, we can use best practices to give everyone a chance to study alternatives, have their voices heard, and select the direction we in consensus choose. The Saxe Athletic Field is one alternative, we need to stop lurching from one alternative to another but instead look at all the alternatives in a careful and thoughtful way, then let the people decide what they want for New Canaan for the decades to come and make it come true. Just leave it were it’s at. a new selectmen comes in. Michael misreported that I am “pressing the idea” of locating a new Police Station at Saxe field, which is an idea that had been put forth by former Police Commission Chair Stuart Sawabini. At a Selectmen’s budget review meeting of the Parks & Recreation Commission and the Board of Education this week I was merely exploring the idea of moving the baseball diamond at Saxe to Kiwanis Park — unrelated to the idea of the Police Station relocation — because the current location of that baseball diamond is not ideal (having no parking) and because Kiwanis Park is so underutilized and also because the New Cannan Athletic Foundation has expressed interest in relocating that ball field to Kiwanis Park. The question of whether the current Police Dept building on South Ave should be renovated (at a cost now estimated at $10.7 million) or whether alternatives such as relocating the PD to another location (such as the Covia Building or building a new building somewhere), is carefully being studied in consultation with two leading architecture firms that specialize in Police buildings. We are a long way from reaching a recommendation about renovation versus relocation because there are several variables still in motion, but I assure you that there will be ample opportunity for community input before a final recommendation is reached. Thank you for submitting this comment. 1. Though it’s true you largely avoided uttering the words ‘Police Station’ during selectmen meetings this week, your assertion that the baseball diamond relocation is unrelated to the proposal for a police station at the Saxe field is inaccurate and misleading. At the Jan. 10 media briefing where you first brought Stuart Sawabini’s proposal to light, you left no doubt that moving the baseball diamond was to clear a space for the proposed new building—I have embedded the relevant audio file to the top of this article. If you’d wanted to say the two matters were unrelated, perhaps saying so to Nick Williams and Kit Devereaux as they took issue with the Sawabini proposal would have been effective—though I imagine that would have led to where you are in this comment thread. 2. You say you expressed no opinion or preference on the Sawabini proposal. I agree. Where in the article does it say otherwise? The headline says only that you are pressing the idea of the field despite opposition, which you did. And when I say ‘opposition’ that is a reference to opposition on the record from Williams and Devereaux, not to others who bridled at this idea and raised questions or opposed it outright at public meetings or on NewCanaanite channels, such as Steve Benko or Bryan Luizzi or Jay Egan or Craig Donovan or Angelo Cerbone or Betty Lovastik or Norm Jensen or Peter Accinno or Cam Hutchins or Thomas Lynn or Laura Ault or Wayne Seltzer or Bernard Simpkin or Matt Grow or Homero Villreal or Katheryn Morley or Lisa Melland or Sheryl Kilkenny or Bruce Macdonald or Ben Harvey or Abby Newton or Jack Volpe or Betsy Wilson or Robert Russo or Arlene Dyrvik or Allison Petrides or Maura Delaney or Brent Harrell. 3. Regarding your feeling that something needs to be done regarding the Police Department, that’s been established for years, as noted and hyperlinked in the article. 4. You also note that this idea came from Stuart Sawabini, not you. Please see that the story notes twice, explicitly, that the proposal for a police station at Saxe field came from Sawabini, and I don’t see how a reader could be misled that it came from you. I look forward to discussions during the budget hearing of removing the Saxe baseball field to Kiwanis Park— your newfound passion project which, curiously, appears nowhere in your own proposed town budget—as a standalone capital expenditure that in no way is connected to a future site for the New Canaan Police Department. Please understand that if town officials or residents voice opposition to this plan, it could merit coverage in local news. Mike Dinan in top form yet again! I am so sorry I voted for this man. Couldn’t have said it any better myself. Thought I was voting for the typical fiscally responsible Republican of old. Instead, we have a spender in the Democrat mould. Tax increases not far behind, revaluation or not, folks. There is a distinct advantage for high school and middle school (town program) athletes to have the fields in their current location within walking distance from the school. This would not be true of the Kiwanis location. The assertion that there is “no parking” at the Saxe baseball fields is misleading; the Saxe parking lot is available after school hours and on weekends. Some attendees have tried to park along Farm Road, which is prohibited.